Mary Boyceis Emeritus Professor of Iranian Studies at the University of London.John R. Hinnellsis professor of comparative religion in the School of Oriental and African Studies at the University of London. He is the author ofHandbook of Living Religionsand editor of thePenguin Dictionary of Religions. If you're interested in Zoroaster and the religion that came to bear his name, this book is essential reading. In it, Mary Boyce extracts and organizes texts from the now-(I gather)-degenerate form the Avesta has taken in the centuries since the religion became marginalized by Muslim conquest, into a comprehensible, rational sequence covering the the entire history of the religion. The translations are clear. The only caveat I have is her justification of a late Bronze Age date for the time of Zoroaster's life. Other than the archaic language of the Gathas and the simplicity of the society presupposed in the text, she offers no evidence, archaeological or otherwise, for the preservation, transmission, and flowering, in the later Persian empire, of Zoroaster's singular viewpoint. She requires a huge leap of faith the reasonable reader shouldn't have to make. For this reason, William Malandra's "Introduction to Ancient Iranian Religion" is a valuable companion and counterpoint. When reading about archaic language and viewpoints, it's good to keep in mind our own experience with King James English and pastoral religious imagery, in a society where people speak modern English and have never seen shepherds or sheep! This book is a real gem as is the whole series. Series editor John Hinnels, himself an expert on Zoroastrianism he wrote Zorastrians in Britain, has done a good job of getting many experts to put together the most important sources on the world religions. In this one Mary Boyce, the authority on Zoroastrianism and Professor emeritus at the University of London gives us some basic sources. Anyone studying Zoroastrianism knows that new editions of the primary sources dont come out very often. This book contains only selections of the Avesta, Vendidad and other works unfortunately. However, it does contain many other sources including works from Herodutos, Strabo and my personal favorite a newspaper report of the new Atash Bahram in Bombay dated 1897. This is essential for anyone with an interest in the subject. If you're interested in Zoroaster and the religion that came to bear his name, this book is essential reading. In it, Mary Boyce extracts and organizes texts from the now-(I gather)-degenerate form the Avesta has taken in the centuries since the religion became marginalized by Muslim conquest, into a comprehensible, rational sequence covering the the entire history of the religion. The translations are clear. The only caveat I have is her justification of a late Bronze Age date for the time of Zoroaster's life. Other than the archaic language of the Gathas and the simplicity of the society presupposed in the text, she offers no evidence, archaeological or otherwise, for the preservation, transmission, and flowering, in the later Persian empire, of Zoroaster's singular viewpoint. She requires a huge leap of faith the reasonable reader shouldn't have to make. For this reason, William Malandra's "Introduction to Ancient Iranian Religion" is a valuable companion and counterpoint. When reading about archaic language and viewpoints, it's good to keep in mind our own experience with King James English and pastoral religious imagery, in a society where most people speak modern English and have no direct experience shepherds or sheep, except in movies and old-fashioned books! 5.0 out of 5 starsThe only book that is devoted to the study materials and sources for understanding Zoroastrianism. Zoroastrianism is one if not the most difficult religion to study and fully understand. This book is priceless as it contains 11 chapters of invaluable information and resources needed to study or comprehend this obscure but important world religion. Since this book is by the world renowned Zoroastrianism expert Mary Boyce, this book is sure to be accurate and filled with indisputable and expert information. I recommend this for any Iranologist, Historian of Religion, Iranian Studies student, Or a very curious reader who wants to expand their knowledge. This book pairs well with other of Mary Boyce's works (like 'Zoroastrians: Their beliefs and practices' or 'Zoroastrianism: It's antiquity and constant vigour'). 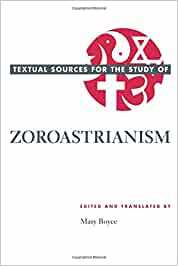 One of the definitive resources for the study of Zoroastrianism. She has written the best books on this subject, that are translated into English. It is important to understand that Zoroasterianism is considered the fountainhead of sin based societies. As such it is easier to understand and study the mechanics of a sin based society in a culture that is distinct from our own, that is distinct from a Christian social model. At once you can see the foundational elements of sin based societies and what makes the function. Armed with these insights you can then compare sin based cultures with shame based cultures. This is a great book if you want to learn how certian concept of Zoroastrian faith emerged on Judism, Christianity and Islam; such as, after life, how Auhra Mazda judges people, and good people will be able to pass a bridge and wrong doers will fall off the bridge. There was one point that Zoroastrian did not share with other faith which was fasting. Last, fire means justice, and Zoroastrian people do not worship fire, as a matter of fact they worship just one God, and call their God Ahura Mazda which means the Wise Lord. The book briefly discussed how Zoroastrian faith shaped ancient political system in Iran. It is a nice book to read and have fun. Most complete and accurate source I have found. Sited by many researchers.